493 backers pledged $112,552 to help bring this project to life. "Comrades. Humanity is on the verge of a new day. After almost two centuries of servitude, we are finally about to emerge from a long slumber. I know that each of you paid his dues in blood and tears. I know that many have lost loved ones and I want to tell you that all these sacrifices were not made in vain. But if we give up now, if we do not accomplish what needs to be done, then there will be no tomorrow and no new dawn will rise for us and our children! But I tell you that we will not accept it, we will not tolerate it! The time has come to break our chains and claim the freedom denied to us for too long. Tomorrow, you will take up arms and walk to the surface. The Machine will attempt to block the road, It will try to break your body and will to get us back to jail. But it will be in vain, because no weapon can hurt the spirit of revenge, no prison can hold us back! On this very day, we vow to end the tyranny of human constructs. On this very day, we take our rightful place. Long live the Revolution! Long live the Resistance! " Escape is a board game with miniatures tokens. Each player leading a group of fighters trying to fulfil their mission objectives before their opponent! Whichever side you choose, the campaign will be tactical, fast and fierce! In December 2011, Escape the boardgame was successfully published in France in Ravage magazine. Our goal was to design a low cost and accessible boardgame, quick to set up yet with a very fluid and immersive gameplay ! Escape was a resounding success on newsstands and in hobby stores, with more than 3000 units sold! In order to meet this demand we quickly went back to work…. Today a large part of game design and creation is done, but we lack the ability to finance the production of the tooling for the plastic models or the edition of the high quality cardboard box and gaming material. While your contribution will drive down production costs by making more copies, and allow to release the game as described below, we commit to save part of the funding to develop more gaming content and provide at the end of the campaign a well rounded product and a great gaming experience! If Escape is the kind of game that tickles your fancy, then here are the various pledge levels. We appreciate any help we can get! Escape is a board game for 1 to 6 players developed by Mohand and Fabrice Tran and published by Taban Miniatures. A game lasts 1hour. Ashton - exclusive Escape version ! Alice - exclusive Escape version ! Duncan -exclusive Escape version ! Blue Rikishi – defence Drone - exclusive Escape version ! Dr Ito Kureiji - Exclusive Kisckstarter model ! I'm in. What do I need to do first? 1 - If you've decided to support our Escape Kickstarter you need first to select your pledge level. Each pledge level corresponds to a specific reward. 2 - Pick up your Escape goodies ! 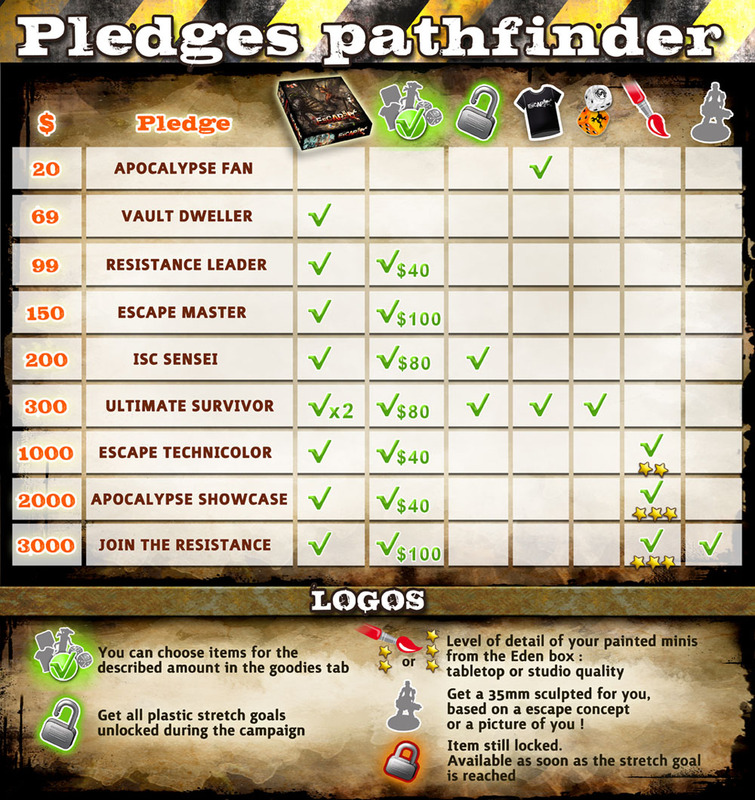 Some of the pledge level includes a given amount of Escape Goodies that you will have to choose from our goodies list. Check the amount included in your Plege, the "Escape Goodies" section of this page, and pick up what you need ! We will send a survey out after the Kickstarter so we can ask you what is your choice of goodies. Mind that the content of these pledges may change unexpectedly from day to day. These updates will occur as we met stretch goals to release and add more cool items. 20$ - Apocalypse Fan : Get an Escape exclusive T-shirt delivered to your door. up to 40$ worth of Escape goodies of your choice. up to 100$ worth of Escape goodies of your choice. With these 100$ Escape goodies, you can for instance, get all the plastic stretch goal items unlocked since the begining of the campaign ! And now the pledges for true players ! Mind that these packages include gaming material we will have to unlock together during the campaign. up to 80$ worth of Escape goodies of your choice. 380$ - Double Dragon : everything from ISC Sensei X 2. Ideal pledge if you team up with another gamer ! Save on pledge and shipping costs ! Limited pledges 50 units each ! A special selection of packs for retail stores including multiple copies of game, expansion packs and goodies, all at your usual retailer conditions! Note that this Kickstarter campaign version of Escape and exclusive goodies won't be available in the regular commercial offer... hence very sought after by players ! D-Day Launch version offers an extra 50$ discount ! Your shop will be listed in our retailer directory. Limited pledge 3 units.Resistance Leader (99$) + a resin copy of all the miniatures included in the Escape box painted at tabletop level by our studio painters ! Ultimate Master (300$ pledge) + get your own miniature concept brought to life : Design an escape concept with our studio artist, and get yourself portrayed as an exclusive escape model. The first one will bring "Lawrence" to our Escape goodies pool ! Check the picture below for the work in progress ! Escape Master (150$ pledge) + a resin copy of all the miniatures included in the Escape box painted at studio level by Mohand + a 35mm model sculpted upon a concept of your choice or a picture of yourself + your name given to one of the unlocked fighters ! We decided to set up a limited number of pledges for a clearer campaign, but if you want to support us further (and benefit from a better game experience) you can also optionally pick up some goodies. Get a full color Eden rulebook (32 pages) + a deck of profile, missions and tactical cards that will allow you to use your Escape miniatures to play one of the best skirmishes games around : Eden ! Resin casted LAB03 doors (set of 3 large doors, or set of 5 small ones) 20$. Although our pledges include by default many "Escape Goodies", you can add even more stuff while backing the project ! To add an optional item, just increase your pledge by the appropriate amount. To get the details of these items, we will contact each contributor once the Kickstarter ends by sending a survey. Beyond the initial game content and funding needs, we have many great ideas on our studio workbench. Whether or not they come to life will depend on the overall amount of funding we get. These add-ons will be included in the "Escape Goodies" pool ! 47000$ - Modular board / UNLOCKED ! : Our game design team is working on an additional board : 4 x1 Ft (30cm) square tile; 2 sided and modular. The Escape players who are looking for diversity will be delighted ! 49000$ - ISC Scientist -UNLOCKED ! Dr Ito Kureiji has joined the ranks of the ISC ! We’ll add this ISC miniature to every copy of Escape ! The ISC scientist is a Kickstarter campaign exclusive model and won't be included in the regular Escape box ! 54000$ - L.A.B. 03 Doors : Unlocked ! We are crafting a set of 3 large doors and a set of 5 small doors. 3D ! These sets will be resin casted and included automatically to the ISC sensei and Ultimate survivor pledges . 59000$ - Martin : UnlockedAdditional Resistance fighter - Let's stand any fight against the ISC with the help of Martin ! We’ll add a sixth resistance fighter to every copy of Escape ! We will swap the initial plain bases for these nicely textured ones (both for small and big Escape models) all L.A.B 03 themed ! This model will only be available to the pledgers of this Kickstarter campaign ! Automaticaly included in the ISC Sensei and Ultimate survivor pledges. 69000$ - Resistance Puppet Master - UNLOCKED ! Something big and mean to bash the evil ISC drones ? Field the Puppet Master (Resistance walker) ! model added to the Escape Goodies pool (25$) and to the pledges "ISC Sensei" and "Ultimate survivor". Alice (in grey) shown for scale purpose only. 80000$ - Resistance Puppets : UnlockedDid you think a Puppet master would perform without his tools ? All the ISC Sensei and Ultimate survivor pledges get 3 additional Puppets. 85000$ - Green Youkaïs : UNLOCKEDeven the walls will prevent your escape! The Green Youkaïs are coming to reinforce the swarm bots in the multiplayer mode to prevent the Resistance from going away. These 3 miniatures will be added to ISC Sensei and Ultimate Survivor pledges. Other levels of pledge level can select the as Escape goodies ($25.00 for one pack of 3 models) This model is Escape exclusive ! 90000$ - Yellow Okoshu : UNLOCKED ! a mean hunting horror of the ISC ! 95000$ - Marvin : Unlocked ! Need someone to disable these annoying ISC Drones ? Here comes Marvin ! The Resistance has enlisted a true drone buster with this stretch goal ! 105000$ - Blue Kira : UNLOCKED ! Another automated horror of the ISC raised from the demented circuits of N.O.A.H. The Blue Kira will be back to L.A.B 03 ! 110000$ - Jerico : The walls of L.A.B 03 will fall appart with this resitance fighter if we beat this goal ! 115000$ - Blue Fusetsu : You though that escaping LAB 03 would be easy with the help of the Puppet Master ? Maybe not ! Show your support over the internet with our Escape avatars ! Most of the game Escape is already designed and tested. Our design team is now focussing on the additional profiles development and final gameplay tuning. Taban Miniatures and the Escape authors have a large experience in this domain, drawn fro 4 years of monthly releases for our skirmishes game EDEN. Additionally, the core design of Escape has already got a warm welcome from thousands of players through the Magazine version. And we will had nothing but extra fun and gameplay goodies to it ! As for any international project Escape could met unexpected delays. However, we have carefully chosen our partners for their experience. We perfectly know that handling the heavy packing and shipping generated worload generated by a crowd funding campaign is quite a challenge. During our previous crowd funding experience (Eden universe and Rule book) we had to dispatch over 500 parcels within 7 weeks ! This time we have decided to work with external logistical platforms. One of them managing Northern america, the other one Europe and Asia. These service providers dispatch over 1 million parcel per year ! We trust them to offer a top notch service to our KS backers ! Vault Dweller : Get the regular version of the Escape boardgame box. This package will include any feature of the regular game box, and any of the Kickstarter exclusive box content unlocked during the campaign (see pledge description for details). Resistance leader : Vault Dweller (69$ pledge) + up to 40$ worth of Escape Goodies of your choice. Escape Master : Vault Dweller (69$ pledge) + up to 100$ worth of Escape Goodies of your choice. Double Dragon : everything from ISC Sensei X 2. Ideal pledge if you team up with another gamer ! Barter Town Boss - D-Day Launch Special - A special selection of packs for retail stores including multiple copies of game, expansion packs and goodies, all at your usual retailer conditions! Your shop will be listed in our retailer directory. This reward is only available to traders - for full details, including shipping rates, please contact Taban Miniatures (See FAQ for contact details). Barter Town Boss - A special selection of packs for retail stores including multiple copies of game, expansion packs and goodies, all at your usual retailer conditions! Your shop will be listed in our retailer directory. This reward is only available to traders - for full details, including shipping rates, please contact Taban Miniatures (See FAQ for contact details). Mini Creator : Ultimate Master (300$ pledge) + get your own miniature concept brought to life : Design an escape concept with our studio artist, and get yourself portrayed as an exclusive escape model.